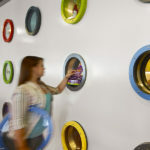 The office in Cambridge Center is a workspace, a playground, and a theme park. 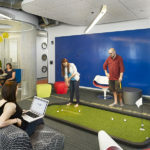 This company creates space to attract and retain the best talent while maximizing collaboration and team building. Our work with this search giant’s Boston team began in January 2010. We helped the client expand their current offices by adding an initial 20,000 SF floor with office space and a full-service kitchen. This work was quickly followed by additional expansions and the development of a MBTA “T” campus concept for future expansions. 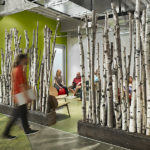 The company is committed to achieving LEED Gold certification, and we worked hand-in-hand with the client to design a space that is as practical and usable as it is environmentally conscientious. Program highlights include a 20,000 SF full-service cafeteria that seats more than 800 people and serves nearly 1,200 meals each day, a 5,000 SF bistro, a fitness center, a 24/7 customer support center, a professional barista, multiple game rooms, casual meeting spaces, and reconfigurable 500, 200 and 100-person meeting spaces. This project received many awards including the 2016 IIDA New England Award for Best in Show, the 2015 Interior Design Magazine Interior Design MakeItWork Award for the MakeIt Private, Recharge Room, the 2015 International Design Gold Award for Interior Design, and the 2013 Boston Properties Innovation in Design Awards.